indianaquariumhobbyist.com Forums » Post 183595 » Re: Synodontis eupterus? http://indianaquariumhobbyist.com/community/ :: View topic - Synodontis eupterus? Posted: Fri Jan 29, 2010 11:55 am Post subject: Synodontis eupterus? I thought I had purchased a Synodontis Nigriventris, as my upside down cats. When they were little, they looked like what S. Nigriventris does. They swam and stayed upside down for most of the time and hid for most of the day. But I noticed an insane growth-rate in them, which left me with doubts whether I had the right ID on ths fish. When I got a clearer shot of the fish, I realized that I may behaving the S. Eruptus. Need confirmation on the same. Here is a picture. Also do any of you guys have this fish? Any predatory behavior seen in them? Read that it grows to 8-12 inches. Anyone has such a big one? Posted: Fri Jan 29, 2010 12:13 pm Post subject: Re: Synodontis eruptus? Synodontis eupterus can be a PIA because of their territorial behavior, unless you keep them with larger fishes. Posted: Fri Jan 29, 2010 12:31 pm Post subject: Re: Synodontis eupterus? You know what? You are one of the best photographers here on the forum, keep it up!! Posted: Fri Jan 29, 2010 12:38 pm Post subject: Re: Synodontis eupterus? Posted: Fri Jan 29, 2010 6:33 pm Post subject: Re: Synodontis eupterus? Beta, Firstly, thanks for the correct name. Have updated the title. I thought these were kind of peaceful. Have you experienced any agression by these guys against any specific fishes. I am assuming their primary territorial behaviour would be against other bottom dwellers. Most of them are Botias. As of now they spend most of their time up-side down under the driftwood and forage out for food in the dark. Thanks Yogesh. Im truly humbled when you even compare me to the champs out here. Probably it was my earlier ignorance when it comes to syno's that inclined me towards believing that the little ones were nigriventris. When smaller, these guys were pretty dark colored, and the spots that you see in the above image werent as distinct (or maybe i didnt notice since they hid so much). I hadnt taken notice of the high-fin in the google-image results for S. Nigriventris. (havent seen a real nigriventris yet). Also thanks for the confirmation on the id. Btw anyone seen any other species other than Eupterus & Nigriventris on the market lately? Posted: Fri Jan 29, 2010 6:36 pm Post subject: Re: Synodontis eupterus? Their aggression is usually reserved for the bottom dwellers like you mentioned. That includes any catfishes, cichlids and some loaches as well. Posted: Fri Jan 29, 2010 6:40 pm Post subject: Re: Synodontis eupterus? Im truly humbled when you even compare me to the champs out here. Posted: Sat Jan 30, 2010 11:23 pm Post subject: Re: Synodontis eupterus? Mystus leucophasis is in Bagridae. Posted: Sat Jan 30, 2010 11:34 pm Post subject: Re: Synodontis eupterus? I have a single S.euptera with me now. Had another one which was thoroughly harassed by this guy. He s with B.almorhae, a Rita chrysea, a Mystus leucophasis and another Syno who s ID Im not really sure of. No issues as of now. He s been with me for around 2 years. Doesnt bother the other Syno either. This doesnt mean he s not territorial of course. Intruders are chased away quite efficiently. When the other euptera was around, he was quite a nuisance. He also single handedly decimated a Mystus who was as big as him. Not aggressive towards all species but can be quite effective if need be. Posted: Sun Jan 31, 2010 1:26 am Post subject: Re: Synodontis eupterus? Thanks for the info Jib & Balaji. These guys sound pretty scary by your behavioral descriptions. Will keep an eye on them. I think the botia loaches will manage with these guys, but I now fear for the bristlenose. Had got 4 of them, thinking they were nigriventris. Time to give some away. Btw, saw some catfish that looked like some mystus species in a LFS. Looked like some native local species. Can you name a few that are endemic to India, and ill try a google search to identify the guy. I don't think these guys would be imports by any chance. 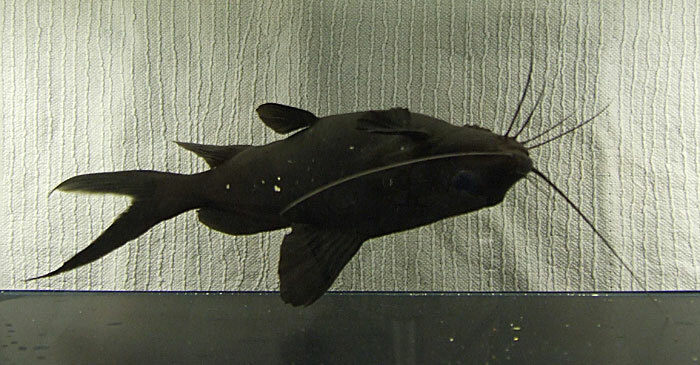 Also was reading about the Synodontis multipunctatus (cuckoo catfish). Pretty interesting fish. They and some close relatives are said to be the only few brood parasitic fish. Do you know of any other brood parasites? Posted: Sun Jan 31, 2010 2:21 am Post subject: Re: Synodontis eupterus? Here is a nice video I found on the spawning of the S. Multipunctatus. Posted: Sun Jan 31, 2010 12:22 pm Post subject: Re: Synodontis eupterus? If it doesnt look like the above, I would be very interested in looking at a pic. Posted: Mon Feb 01, 2010 1:57 am Post subject: Re: Synodontis eupterus? Ill visit the LFS and try to get pictures, but it actually doesn't look like the above three. It was similar to the Mystus tengra, but the markings were lighter.